How served: 750ml caged and cork bottle poured into a La Trappe chalice. I paired this beer with: Fish stew topped with an Irish sharp cheddar and served with bread made with Sierra Nevada Bigfoot. Notes: La Trappe is 1 of the 7 Trappist Breweries and the only one found outside of Belgium. The beer poured a hazy light orange with a 1 and a half finger fluffy off white head which dissipated before I was a quarter of the way down the glass leaving a minimal lacing. The nose of this beer was of sweet caramel, toffee, bready yeast, plums, raisins and candi sugar. The taste started off mildly sweet with toffee, caramel, raisins and plums, mid way through I got some spices which included hints of cinnamon and it ended on the dry side. The body with a thin to medium and coated my mouth with a mild oily slickness with moderate carbonation and finished with a pleasant warmth from the alcohol. The drinkability was very good. I’m very glad that they (La Trappe) decided to make this a year round brew, instead of the intended one off brew. On the Label: The monks of Brewery de Koningshoeven have been brewing La Trappe beer for a living since 1884. La Trappe Isid’or has been specially created to commemorate the 125th anniversary of Brewery de Koningshoeven. This ceremonial beer was named after Brother Isidorus, the first brewer of La Trappe. 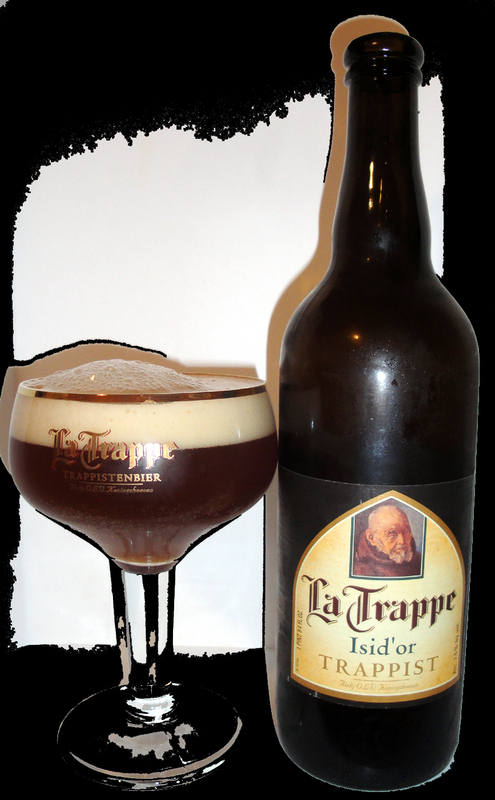 La Trappe Isid’or is a mildly sweet amber beer with a hint of caramel. Soft bitter flavor with a fruity after taste. Brewed with own grown Perle hops. Serving temperature 10 – 12° C.
La Trappe Trappist Ale can be aged like fine wine. Malts: Pale, munich, caramel, and wheat malt. Hops: Halletauer and Koningshoeven Perle. To mark the 125th anniversary of the Trappist brewery, a special anniversary beer was brewed in 2009. This Trappist beer was named after Isidorus, the first brewer in the abbey O.L.V. van Koningshoeven. It was intended that this beer would only be brewed in the anniversary year. However, Isid’or was so well received that Abbot Bernardus decided to adopt this Trappist beer into the permanent range. How served: 330ml capped bottle poured into a La Trappe chalice. I paired this beer with: Eggplant parmesan. Note: Best by date was 02-2010. You will find this beer in the US under the name ‘Koningshoeven Trappist Ale’ as in the USA and Canada, ‘La Trappe’ is marketed under the name ‘Koningshoeven Trappist Ale’.